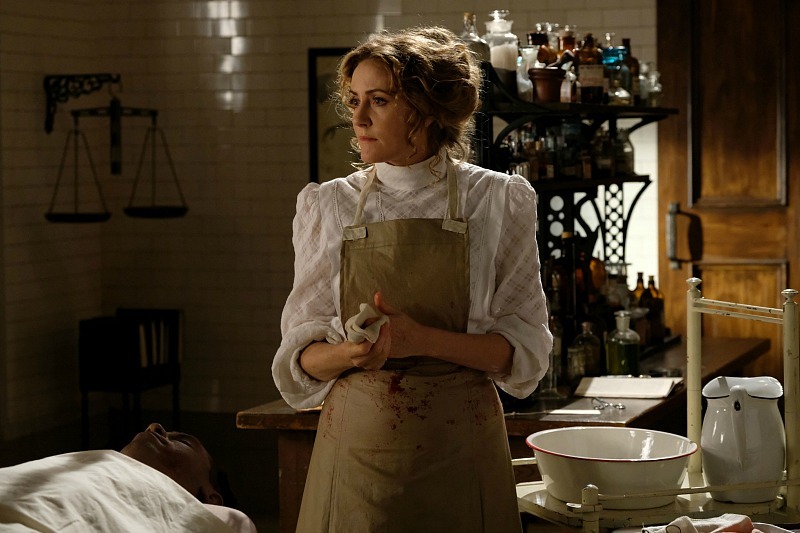 Preview: “Shadows are Falling” on Murdoch Mysteries | TV, eh? The Murdoch Mysteries fans have spoken! Last week’s episode, “Game of Kings,” was a resounding favourite and I totally agree. Maureen Jennings’ script was jam-packed with history, humour and action; everything that makes for a great instalment. Murdoch and Ogden must put aside dealing with a personal matter when Nate Desmond is charged with murder. And here are more morsels to chew on while you wait until Monday. Jonny Harris and his writing crew captured their second Canadian Screen Award in a row for their work on Still Standing. The series took home the trophy for Best Writing, Factual. This is, after all, the penultimate episode of Season 11. You didn’t expect everything to be hunky dory, did you? Yannick Bisson and Hélène Joy put in performances of the season on Monday night. Keep your tissues close by. With Nate accused of murder, it only makes sense to have Rebecca James return to Toronto as well. The man collaring Nate is none other than the newly-promoted Horace McWorthy, played by Sean Bell, of Station House No. 1. That means Watts does some digging in his old stomping grounds. Meanwhile, parts of the investigation are particularly painful for William and Julia. The last several minutes of “Shadows are Falling” is shocking, sad and changes everything. Images courtesy of Stephen Scott for CBC. Just wanted to pointout that Mary Pederson uses the name Mary Rogal-Black for Murdoch Mysteries. Why writers risk losing their loyal viewers by creating misery for those of us who are hoping for a good outcome for our fictional cast is beyond me. I am not sure I have the courage to watch the last two episodes. I guess writers want to change things up. Though I hope nothing happensto Julia and her baby. She and William are so happy to finally be having a baby. I’m wondering if Violet somehow knows Rebecca or Nate. She’s got something up her sleeve. I hope the pregnancy goes to full term too! This is a beautifully written and superbly acted tv show. We may hope for things to happen but basically it’s written for plot and character development. It’s ENTERTAINMENT! Sit back and let it entertain you! !